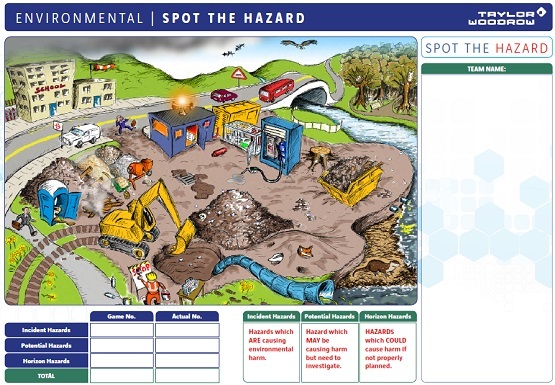 At our site, reporting of environmental near misses and close calls were poor and it was clear many of the operatives were struggling to identify what environmental hazards might actually be and toolbox talks and posters were not working. Training was needed – but for a 300 strong diverse workforce how could we develop effective training? Many on our sites are not necessarily academic style learners – we are visual and like to be engaged and active not just talked at. In addition, we need to consider varying degrees of comprehension with spoken English meaning technical terms can be more challenging. Using behavioural techniques and a ‘spot the hazard’ style game teams of operatives were given a simple system of how to rate environmental hazards and were asked to spot ones at each level. The quiz sheets were marked by opposing teams and prizes offered to the winners. There was enthusiasm, noise and a clear sense of learning and enjoyment. Each operative was asked to go out onto their site and apply their new learning to close-call reporting. This game was designed by an Environmental Manager using a graphic designer – there is no behavioural solution of its kind available to purchase or use elsewhere. Increases in close-call reporting have been significant and led to the identification of issues the environmental team can resolve. There have been no significant environmental incidents on site, down to a pro-active response in close-call reporting. This initiative was rolled out to other Taylor Woodrow sites and received a Crossrail Award for Environmental Engagement.